The H-Cube Midi™ allows the users of the H-Cube™, H-Cube Mini Plus™ and H-Cube Pro™ to scale up reactions and achieve the same result up to the capacity to 500 g per day without compromising efficiency and safety. 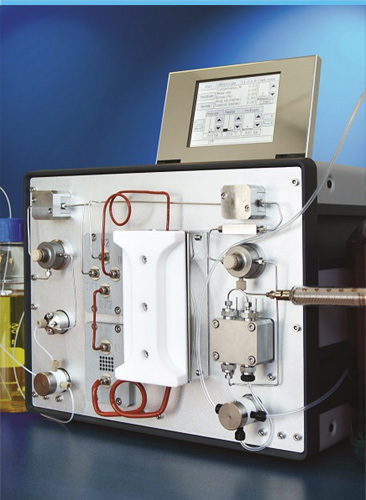 The H-Cube Midi™ system is designed to fulfill the need towards process scale-up flow hydrogenation. Within minutes, product emerges for fast reduction. Reductions varying in scale from 10 g to 500 g can be performed on the same compact reactor. The Phoenix Flow Reactor is a powerful instrument which reaction zone can be heated up to 450 °C and is compatible with multiple types and sizes of reaction zones (CatCarts, MidiCarts, coils, metal-metal sealed catalyst columns). When connected, the two reactors are controlled separately on their own and it is possible to have the high-throughput flow and hydrogen generation from the H-Cube Midi with the versatility and high-temperature of the Phoenix Flow Reactor.